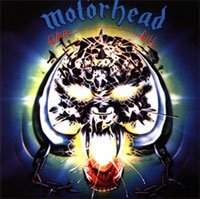 MOTORHEAD - OVERKILL LTD. VINYL (LP) | Online Shop | Wizard LTD. Album: "OVERKILL LTD. VINYL (LP)"
Overkill is the second album released by Motorhead, in 1979, and their first for Bronze Records. It peaked at number 24 on the UK charts. Bronze Records signed the band in 1978 and gave them time in Wessex Studios in London to record Richard Berry&apos;s "Louie Louie" and a new song by the band, "Tear Ya Down". The band toured to promote their single "Louie Louie" while Chiswick released the Motrhead album in white vinyl, to keep the momentum going. Sales of the single brought the band their first appearance on BBC Television&apos;s Top of the Pops, which gave Bronze the confidence to get the band back into the studio to record a second album.